Things haven’t really worked out as planned for Mike Williams since entering the NFL, as he’s trying to find a place on some team this offseason, getting earlier interest from the New England Patriots and now with the Cincinnati Bengals. 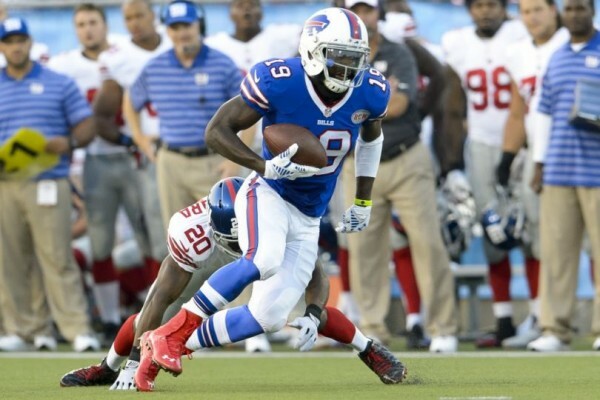 Williams, a fourth round pick in 2010, is coming off a season with the Buffalo Bills with just 8 receptions, 142 yards and one touchdown in nine games for the Bills. He was a full-time, 16-game starter for the Tampa Bay Buccaneers from 2010 through 2012, compiling 193 receptions, 2731 yards and 23 touchdowns. He signed a six-year, $40.25 million contract with the Buccaneers before the 2013 season, and since then got traded to the Bills and hasn’t done much when he was healthy. An interesting Yahoo article about the influence the Patriots have over the free agency market could tell why there’s a recent interest in Williams all of a sudden, with teams jumping on players they’ve heard the Pats have worked out or scouted. It might leave a window open for Belichick to troll teams and make moves but not sign players he thinks could hurt other teams, but that’s trying a bit too hard to find more evil where there’s enough of it, at least on a perception kind of level. The Bengals do need some help at wide receivers and overall, Andy Dalton is going to throw to an almost completely new group of pass catchers in 2016. Adding another one wouldn’t hurt, but at this point, it seems Williams is added just for cover, and the regular week-to-week basis of the regular season, he isn’t expected to contribute too much or play too many downs.